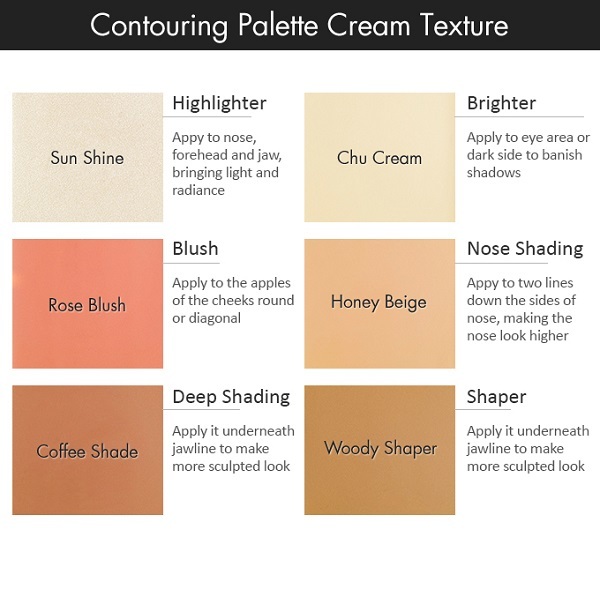 The contouring kit consists of highlighter, blusher, and shading in closely adhering cream type. It can define the contour of the face all at once. -Highlighter: Add a volume effect to the nose bridge, front side of the forehead, and chin. - Dull area cover: Apply on dull skin under the eyes in a tapping motion. - Blusher: Apply blusher on the cheek areas in diagonal or circular motion. - Nose bridge shading: Apply shading on the lateral sides of the nose bridge to make the nose look high. - Deep shading & shaper: Apply along the contour of the chin and face to express natural facial line.